A number of cultural heritage organisations and schools across Europe, Australia and New Zealand have come together in an exciting education project as part of the World War I centenary commemorations. This centres on the Gallipoli campaign of 1915-16. Using museum and archive collections students will research the stories of individual soldiers and their families. This information will be shared amongst the project participants and will give a greater understanding of national perspectives on Gallipoli and on World War I. In Ireland this project is coordinated by the National Museum of Ireland – Decorative Arts & History, in association with KCM. Transition Year students of Gaelcholaiste Chiarrai, Tralee will use KCM’s collections to research the involvement of the Royal Munster Fusiliers in the campaign and to discover more about the men from Kerry who took part. 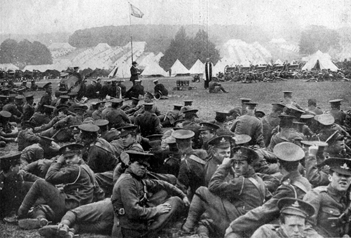 The 10th Irish Division, formed in 1914, attending a church service before being sent to Gallipoli. They participated in the disastrous landing at Cape Helles and fought in the August offensive.